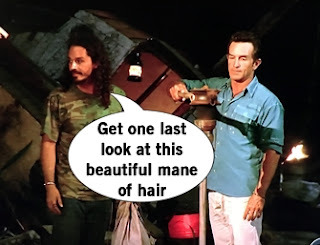 The tribes convene and Probst announces it's time to merge, but explains in order for the group to get their merge feast two people will have to sit out. Tai and Brad self-sacrifice stuffing their faces with food and use the isolated time together to catch-up. Meanwhile, everyone else is gorging themselves and Debbie pretends to be drunk because... well she's Debbie. Donning yellow buffs, the merge tribe dubs themselves Maku Maku and get to work talking, strategizing, and recapping the Sandra/Varner votes. Who shall be the first target? Brad's recommend first target is Michaela who is good at challenges, not trusted, and overall annoys her tribemates. Everyone seems pretty on-board with the plan except for Hali and Cirie. 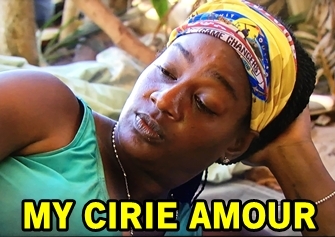 Cirie pulls Michaela aside for a heart-to-heart, telling her to relax and hide her real emotions in this game. Michaela points out she's never seen a two black women sitting together at the end of this game. It seems the trust has been built and Cirie makes it her mission to save Michaela this week. After Andrea wins Individual Immunity, the majority of Maku Maku plan to put the majority of votes on Michaela and some on Hali in case an idol is played. Cirie doesn't want Michaela gone and begins a plan to save her, explaining that this could all possibly be a move to get Hali on Brad/Sierra's side. Cirie tells Michaela that she's the target but to trust her, vote for Zeke (the fake decoy vote), and never speak a word that this machination to save Michaela is a Cirie original plan. Tribal Council time! Discussion begins withtalk of the merge dynamic and the alliances that will dictate the game. Hali vocalizes her fear of the night with no idea what is going to happen, with Michaela agreeing with this sentiment. Idols come up and that unknown element that could totally throw off plans and you always hope to flush an idol. Probst then asks if there are any people that would be willing to strip down to their birthday suit to say, "Hey guys, no idol here!" I can't decide if this is a question or a request from Jeff Probst, but his eyes light up when Hali offers to do such a thing to save herself. Hali says a target should be eliminated from the game, not a free agent. The tribe votes and Hali is eliminated from the game, not Michaela. But wait, there's more! It's a two hour episode. After the vote that ultimately saved Michaela, the tribe seems to be divided into two separate alliances. Cirie and Andrea both vocalize it would be smart to target leaders of the other side, Sierra and Brad. But Zeke isn't sure if this is the move he wants to make and after winning the Marshall's Lounge reward, he tries to recruit Debbie and Tai to his bigger plans to go after Cirie and Andrea. But there's bad news ahead for Zeke because the other side thinks he's a double agent and his actual alliance gets word of his betrayal. The war Zeke hoped to start ends up backfiring and suddenly he's the top target. But alas, there's more moves in play. 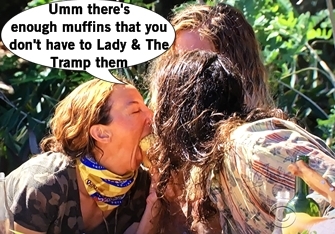 When Ozzy fails to win Immunity in the hold-the-pole challenge he previously won two times, Debbie recommends they make a big move and blindside the challenge king. Plus she's secretly got the advantage with an extra vote in case they need another number. Tribal Council time! There's talk about how the game has gotten much more cutthroat since the merge occurred with true alliances being blurred. Ozzy explains it's about trust and value, and his value is catching fish, which is similar to the Ozzy motto we've known since the first time he played. He is basically a merman. Zeke talks about the jury and how to convince others they could beat him so they could go to the end while putting people on the jury that will vote for him. Cirie explains her vote for the night will be based on trust. After the tribe initially votes, Debbie stands up and declares she'd like to use her Exile Island advantage to cast an extra vote. Then the votes are unveiled: Zeke's alliance turns on him, but it's Ozzy who is ultimately voted out of the game.